A Range Rover Evoque has performed better than its average Real MPG rating by more than 20 per cent in a trip that took in three important Land Rover landmarks. HonestJohn.co.uk’s challenge was to see how far the front-wheel drive Evoque could travel on a single tank of diesel, without so-called ‘hypermiling’, and keeping up with the flow of traffic. 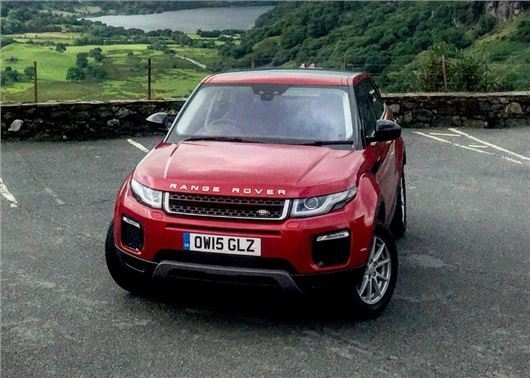 The direct route between Red Wharf Bay and Laggan Bay – these two key points in the birth of Land Rover – is 449 miles, but we decided it wouldn’t be much of a challenge to follow a largely motorway-based route to connect them. Instead we took in some of the great scenery on the periphery of the route, including Snowdonia National Park and the Lake District, as well as a stop at Jaguar Land Rover’s Halewood plant, where the Evoque and Discovery Sport are both built. Fuel economy has become a controversial subject especially in the last 12 months, coming under greater scrutiny since the Volkswagen emissions scandal, and a number of manufacturers admitting measuring fuel economy tests incorrectly. And, as CO2 emissions has become ever more important for tax reasons and because of EU rules on average CO2 emissions, it has become more important than ever for car manufacturers to focus on these in today’s competitive market, and optimise performance for the official test cycle. We filled up with standard diesel from a filling station in Pentraeth on Anglesey and drove a mile down to the sand at Red Wharf Bay, where Maurice Wilks, chief engineer for Rover in the 1940s first sketched his idea for a Land Rover, for the start. The climb back up from the beach had the trip computer around the mid-20mpg level before stabilising in the low-40s through Snowdonia. However, this level would not be sufficient for achieving the aim of arriving on Islay on one tank. For that, we needed to be 48mpg or better for the 565-mile route. We kept pace with the flow of traffic, overtaking slower vehicles where necessary, but also ensured we didn’t exceed the speed limits. The air conditioning remained on while the car was running, and other functions of the Evoque were used as required. When setting off from Angelsey, a range forecast of 483 miles was insufficient, but as we put in some motorway miles, usually at a steady 70mph, it began to creep upwards. At the end of the first day’s driving, at the Scottish border, the trip computer had adjusted upwards, although still short of the range needed. In fact at Loch Lomond, with little chance of increasing fuel economy further in the final few hours, there was still a two-mile deficit. It was going to be extremely tight at best. On arrival at Kennacraig ferry terminal to get the boat to Islay we were down to the last 40 miles of range when we had an epiphany: the navigation had counted the 35 miles of the crossing as part of the trip distance. With around 10 miles the other side until we were in sight of Laggan Bay, where the Land Rover name was first coined, we were safe. But with filling stations closed, we wouldn’t be able to calculate the exact fuel economy for the trip until the next morning. After taking on board 47.18 litres the next morning – 10.38 gallons – and just about five litres left we had to calculate the new distance. It was 530 mile taking out the distance by sea, and achieving 51.4mpg – 26 per cent better than the average Real MPG figure. So, why have the Real MPG figures recorded been lower to date? Obviously, everyone has their own driving style and we use different roads regularly. While we weren’t actively using eco-driving techniques, it is possible for Evoque owners to follow some recommended tips found in the trip computer settings in the car’s dashboard screen (which, incidentally, we didn’t seek to follow on our drive). There is also a driving monitor, which rates the driver’s performance for smooth acceleration, braking and economical driving. It’s likely that if Evoque owners follow these tips, they can still drive in a way they find comfortable and safe, while saving money on fuel. Why we almost didn’t make it . . .
Just 35 miles after setting off, the engine management warning light illuminated, and shortly afterwards, a message popped up saying the diesel exhaust fluid was low. If it wasn’t topped up within 540 miles of this original message, the car would not restart after being switched off. Diesel exhaust fluid, or AdBlue as it’s sometimes known, has become a common requirement in many cars to ensure they achieve Euro6 emissions standards. And all of them will shut down the engine if the fluid runs out. The fluid, a solution of urea, water and other chemicals, is injected into the exhaust to help reduce NOx emissions. It’s used in direct proportion with the amount of fuel burnt, and as this was a press car and had most likely been driven hard over many of its first 8000 miles, the fluid had run low. Some owners would have been able to reach a higher mileage before the alert to add more fluid, but it’s often something that needs attention before a car’s first service. It’s available from filling stations and dealers, but to ensure the exact amount required to fill the reservoir, the car would need to be plugged into diagnostic equipment. Fortunately, when we stopped at Halewood, the technicians at the workshop there took time out from their lunch break to help, and sent us on our way again. Would like to know what brand of diesel you used.